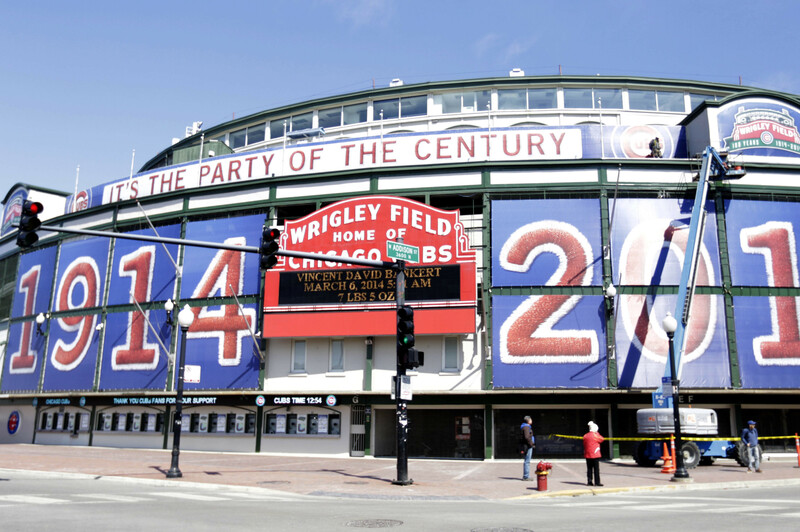 The History Blog » Blog Archive » Happy 100th birthday, Wrigley Field! Chicago’s iconic ballpark Wrigley Field turns 100 years old today. It is the second oldest Major League Baseball park after Boston’s Fenway Park (opened April 20, 1912). Although it is the home field of the Chicago Cubs, they’ve never actually won a World Series there. The famously benighted club’s glory days took place at the long-defunct West Side Park where in 1906 the Cubs scored the most victories (116) and the best winning percentage (.763) in Major League history. The lost to the White Sox in the World Series that year, but won the next two. The subsequent World Series dry spell is the longest in history. Wrigley Field has seen a championship, however, just for a team in a league that stopped existing right after they won. It wasn’t called Wrigley Field then. When it opened its doors, it was called Weeghman Park after Charles Weeghman, the “Quick Lunch King,” owner of a chain of lunchrooms. Weeghman’s diners served only cold sandwiches, and instead of tables and chairs or stools and a bar, they were packed with school-style chairs where a single arm curves around into a table. No hot food = no wait, and eating like you’re taking a test = no lingering. He was able to cram so many people into his diners and get them out the door so quickly that at its peak, the main lunchroom served a mind-boggling 35,000 people a day. Weeghman was never one to rest on his laurels or focus narrowly on his business, a lack of focus that would ultimately lead to his downfall. One of the side-interests he pursued avidly was baseball. He founded a Chicago team of the Federal League, an upstart organization that from 1914 to 1915 challenged the National League and American League as the “third major league.” First known as the Chicago Federals or ChiFeds, the team name was changed for the 1915 season to the Chicago Wales. 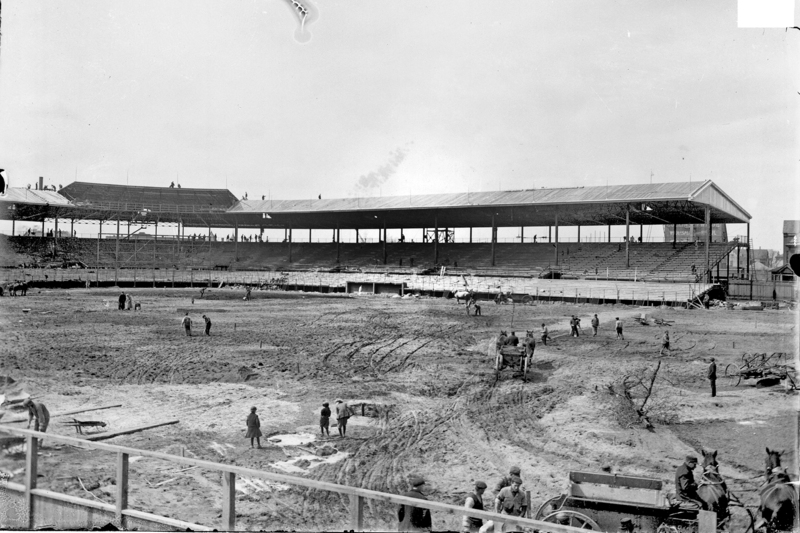 To give his new team a place to play, Weeghman leased land on the corner of Clark and Addison from the Chicago Lutheran Theological Seminary and hired Zachary Taylor Davis, architect of Comiskey Park, to build a new concrete and steel baseball field. Work began on February 23, 1914, with an official groundbreaking on March 4th. You read those dates right. Weeghman Park was built in two months. It cost $250,000. 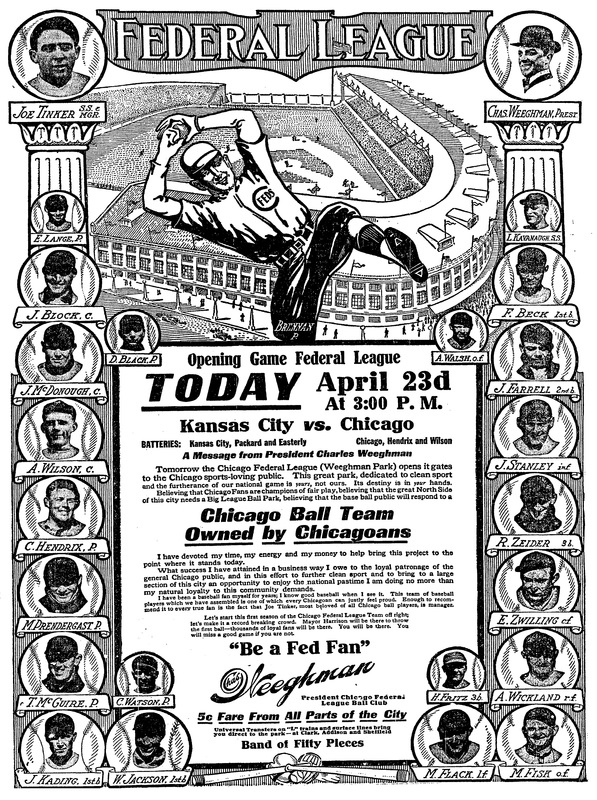 On April 23rd, 1914, Weeghman Park opened with a game between the Chicago ChiFeds and the Kansas City Packers. Future hall of famer Joe Tinker managed the home team, and the Chicago crowds came out to support him and the new team. In an auspicious beginning that sadly would not be bourne out in the long-term, the ChiFeds won handily. You can read the Chicago Tribune’s review of the opening game here. The ChiFeds lost in the finals of the league championship that year, but they won the title the next year, making them the Federal League’s most successful club. That wasn’t enough to save the league. 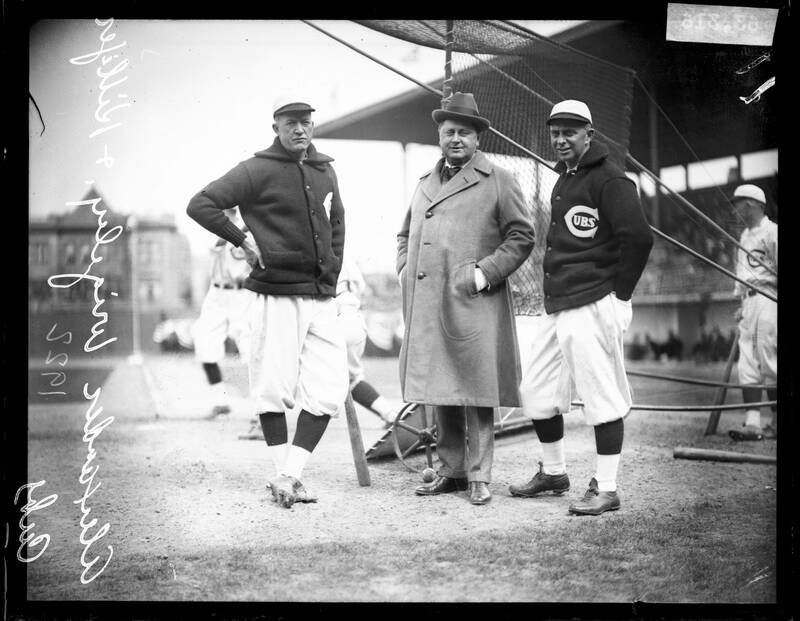 It folded shortly after the season ended, but Weeghman bounced back, acquiring the National League’s Chicago Cubs and bringing them over from the fire-prone wooden West Side Park to his two-year-old Weeghman Park. To fund the record-setting $500,000 acquisition of the team, Weeghman enlisted investors from the Chicago business community, including gum magnate William Wrigley, Jr.
Wrigley’s company was going great guns, while Weeghman’s began to stumble. His investments in film production and theater ownership were failures that sucked support from the diners that had made his fortune. With many of his demographic (ie, young working men) heading off to war, the lunchrooms began to suffer. No sooner had the boys come home than the Spanish Influenza struck. It would claim 20 million lives worldwide before it ebbed. Meanwhile, nobody was keen to lunch in established jam-packed with people coughing their potentially lethal pathogens all over each other. Weeghman tried to shore up his bottom line by borrowing money from Wrigley with shares in the Cubs as collateral, or by selling shares outright. Wrigley took an increasingly direct interest in the club, moving their spring training grounds from Florida to Pasadena where he had a mansion and a large plot of land downtown easily converted into a ball field. By 1918, Weeghman was finished at the park he built. 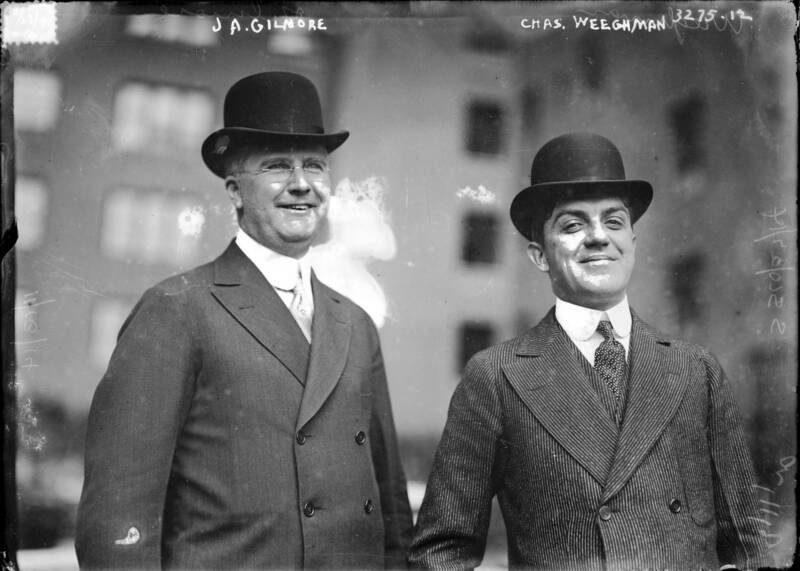 Wrigley owned most of his stock and finally demanded that in return for yet another loan, Weeghman retire as president of the Chicago Cubs and devote himself solely to his business. Wrigley didn’t immediately rename Weeghman Park after himself. It kept its original name for a couple of years, then changed to Cubs Park in 1920. 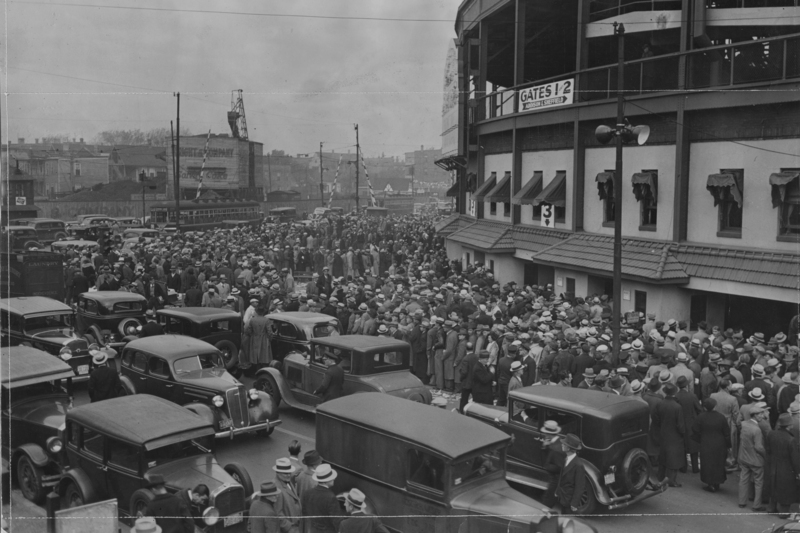 Six years later, in November of 1926, the park was renamed Wrigley Field. It owns many historical firsts. The Star Spangled Banner was first played there before games. Wrigley was the first field to allow fans to keep foul balls they caught (elsewhere they had to hand them over to ushers). It was the first baseball field to have an organist playing. The first televised baseball game was the Cubs versus the Dodgers on July 13th, 1946. It was the last field to host night games because it was the last to install lights in 1988, believe it or not. Babe Ruth made his famous “Called Shot” (if it actually happened) at Wrigley Field in the 1932 World Series, his last year in the game. While almost all of the old parks have been demolished to make way for stadiums with high-tech amenities, Wrigley Field carries on with all its myriad problems and disadvantages. A half-billion dollar renovation is slated to begin in the offseason this year, although there are obstacles, mainly the owners of the rooftop bleachers whose prize locations will be endangered by the refurbishment. Today, Wrigley Field is celebrating its birthday in grand style. The Cubs will play the Arizona Diamondbacks with both teams wearing throwback jerseys of the Chicago Federals for the Cubs and the Kansas City Packers for the Diamondbacks. The first 30,000 fans to arrive at the park will get a free replica 1914 Chicago Federals jersey (WANT!) and will be greeted by ushers wearing period costumes in 1914-style. The ground crews will also enjoy some vintage styles: 1914 Weeghman Park jackets. Even the concessions stands are get into the spirit of things, offering 1910s specials like a breaded pork sandwich with slow-cooked onions and spicy mustard on a toasted roll and a Reuben Dog, a beef hot dog topped with corned beef, sauerkraut, Thousand Island and Swiss cheese. Before the game begins, visitors will enjoy historic photographs and videos on a right field board. Charles Weeghman’s grand-niece Sue Quigg will throw the first pitch using a 100-year-old ball first thrown at a ChiFeds game by her grandmother Dessa Weeghman. For a wonderful series of retrospective articles, see the Chicago Tribune’s Wrigley 100 page. 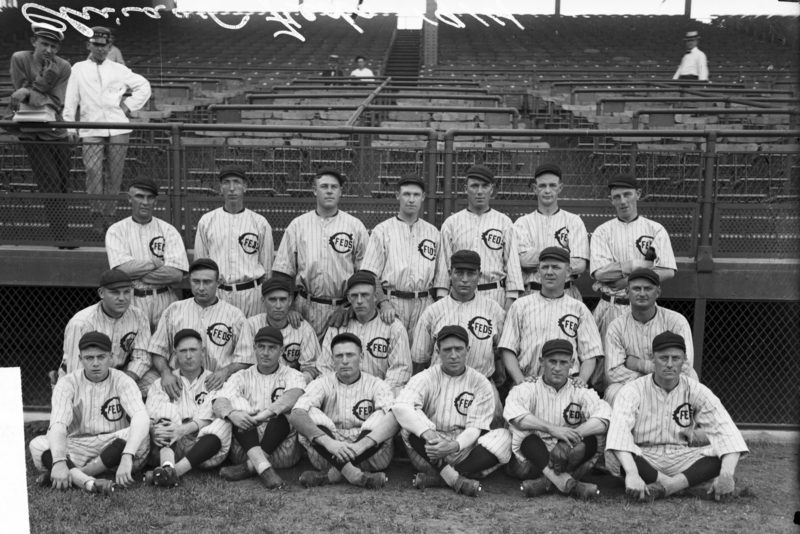 The Chicago Cubs have a site dedicated to the centennial as well. You can purchase tickets there, although I don’t see where they tell you if tickets are still available for today’s game. This entry was posted on Tuesday, April 22nd, 2014 at 11:18 PM	and is filed under Modern(ish). You can follow any responses to this entry through the RSS 2.0 feed. You can skip to the end and leave a response. Pinging is currently not allowed. “It was the last field to host night games because it was the last to install lights in 1988, believe it or not.” I believe it! I lived five city blocks due south of Wrigley Field in 1981 and ’82, and remember the “No Lights” yard signs many of my neighbors had up to protest the inevitable change. At that time I didn’t enjoy baseball (memories of being pressed into peewee league play still being relatively fresh—I being strikingly non-athletic, it was a time of humiliation). Attending the 100th anniversary game would have been a highlight, though. I wish I’d been there. Thanks for the article, which taught me a lot I didn’t know. Nah, Ruth played for the Yankees until 1934 and then played for the Boston Braves in 1935. True to the Cubbies noble tradition, they managed a come from behind loss. Ah, but the more things change, the more they remain the same. Thank you, and thank you for the wistful game report. your blog is great! love the high resolutions! Thank you! I’m a sucker for detail. Your site is phenomenal.